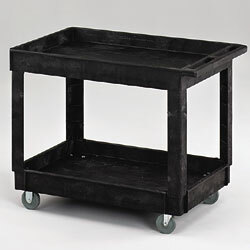 Tough, durable cart is ideal for use practically anywhere. Maintenance-free unit will not rust, dent, chip, or peel. Includes a leakproof top and rounded corners. Ergonomic flat handle has built-in tool storage. Gray non-marking casters2 fixed, 2 swivel. Color: black. IN STOCK. XT-2400 28	 2	 18-7/8"	 30" x 16"	 34" x 16" x 31-1/4"	 31-1/4"
XT-2401 38	 2	 18-7/8"	 36" x 24"	 40" x 24" x 31-1/4"	 31-1/4"
*Also availble in GY - Gray.